Frederick Place connected Middle Street with Vicarage Street for pedestrian traffic and had houses on both its sides until the 1970s. 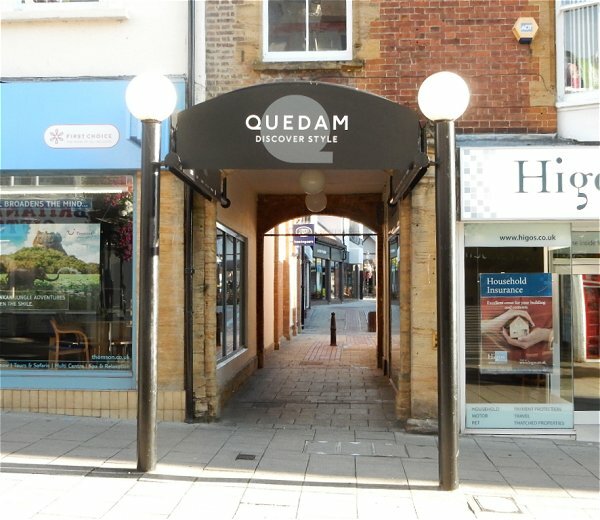 It is now a link from Middle Street to the Quedam shopping centre. Frederick Place was named after Frederick Cox, a local builder, who had a builder's yard there in the latter half of the nineteenth century. Frederick Cox was born in 1825, the son of carpenter, builder and Town Councillor John Cox (1798-1878) and Mary née Hancock (1799-1871). His older brother, William, was to become a jeweller and later Mayor of Yeovil. In the 1861 census Frederick was living with his parents in Middle Street and gave his occupation as 'Builder employing 7 men, & 3 boys'. By 1881 Frederick was married, had seven children, two servants and was still living in Middle Street. He listed his occupation as 'Builder employing 25 hands'. Four local projects built by Frederick Cox were the Medical Hall (1860), Fiveways Hospital (1871), the Congregational Church in Princes Street (1877) and the Corporation Baths in Huish (1885). Frederick Cox was a Freemason, initiated into the Lodge of Brotherly Love in Yeovil on 14 August 1861. 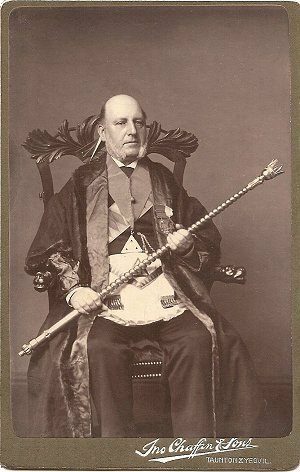 He served as Worshipful Master of the Lodge in 1868 and the photograph above shows him in his Masonic regalia. In 1883 Frederick Cox proposed to the Corporation a new road joining Vicarage Street and Middle Street, that is extending Frederick Place. His proposition was that he would give up land ".... 24 feet wide for the sum of £200, the Corporation to make one half the roadway and pave one side of the street from Middle Street to the gates of his yard.... If the roadway should be 26ft 8in wide, he would sell for £260." While the Corporation saw merit in the scheme, it failed on several counts including the requirement that roads be thirty feet wide and the Corporation expected to take over ready-laid roads and not pay to have them made. The entrance to Frederick Place from Middle Street could, therefore, have looked a lot different than it does today. 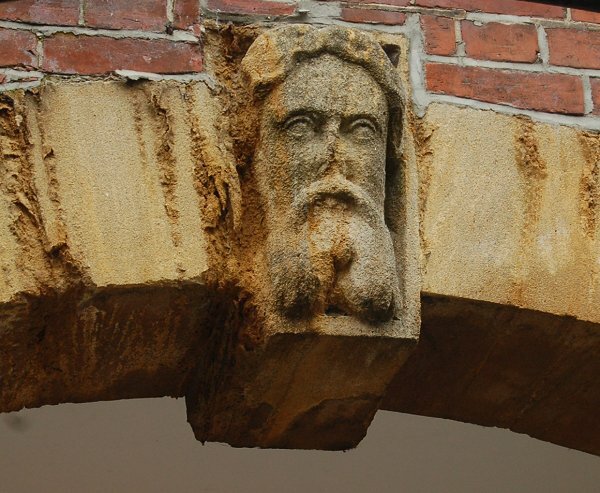 The carved stone head on the arch keystone above the Middle Street entrance to Frederick Place (photographed below) is reputed to be a likeness of Frederick Cox although it clearly isn't - as seen from the photograph above of him dressed in his masonic regalia, probably dating to the early 1880s. Frederick Cox died in Yeovil in 1887, aged 60. This map, based on the 1886 Ordnance Survey, shows Vicarage Street running across the top and Middle Street running across the bottom left. Frederick Place runs between the two at centre. 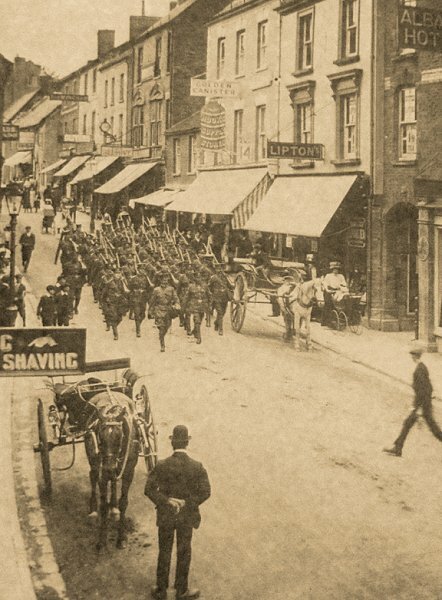 Men of "Kitchener's Army" march down Middle Street on their way to the Western Front. 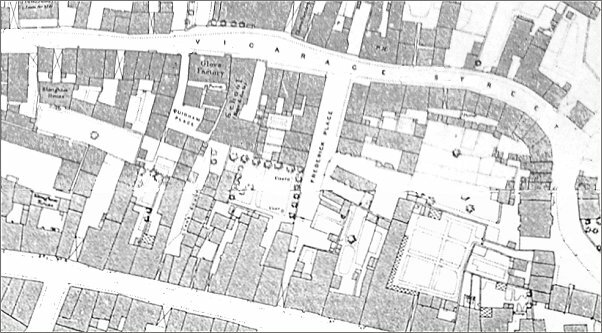 Note Charles Hook's 'Golden Canister' shop at top centre and the entrance to Frederick Place at right. At extreme right is the Albany Temperance Hotel, rebuilt in 1873. Photographed c1915. 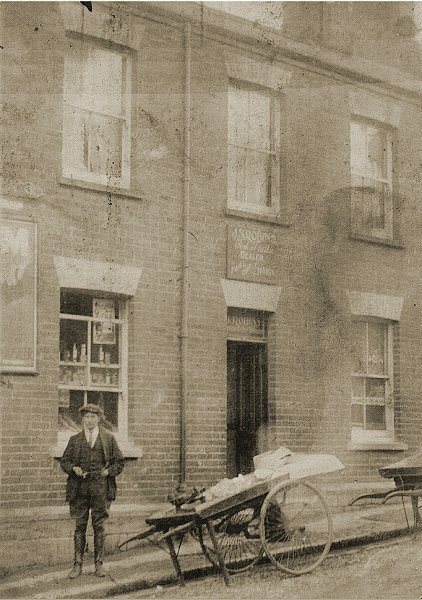 Harold Robins circa 1925 standing outside his parents shop, JS Robins (John & Sarah) Fish & Fruit dealers at 1 Frederick Place. 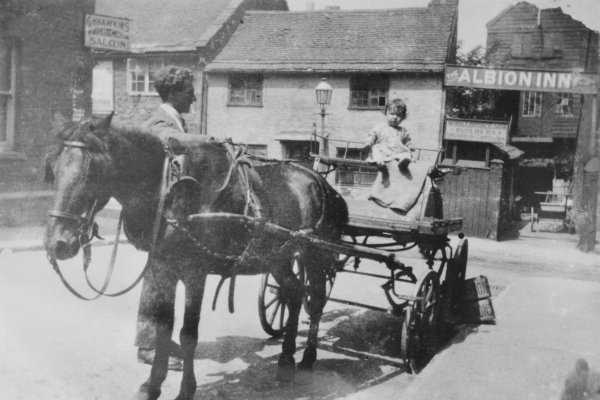 This was on the eastern corner of Frederick Place at the junction with Vicarage Street and was directly opposite the Albion Inn before it was rebuilt. Harold was Tony Robins' dad. This photograph was taken from Frederick Place about 1935 and looks across Vicarage Street. The sign of the Albion Inn is over the inn's yard, the inn itself was off-photo to the right. Tony Robins' brother, Cliff, is sitting in the cart aged about two and wearing a dress - as was the fashion at the time. Tony's dad, Harold Robins, is holding the horse. 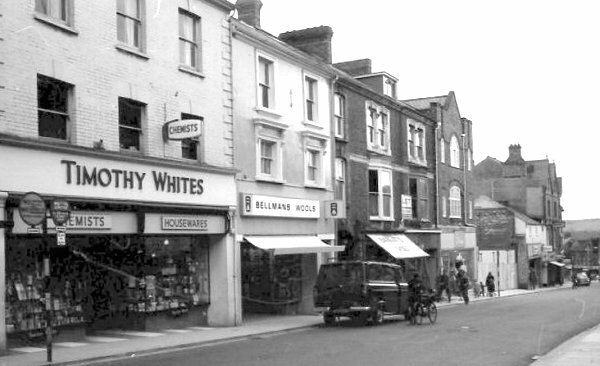 Tony's granddad, Nat Robins, had a shop on the eastern corner of Frederick Place, opposite the inn, again just off the photograph to the right. 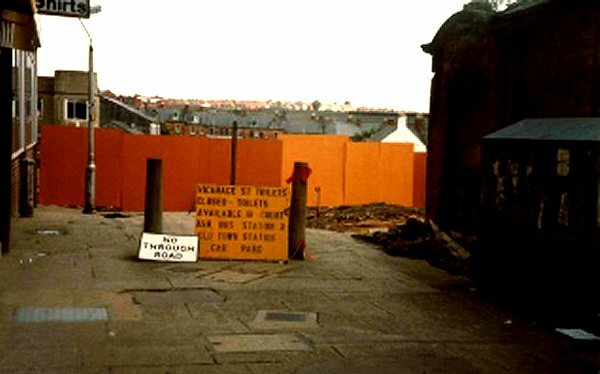 The yard under the sign was W Walbridge & sons, later Perry's, builders yard. The sign at top left is for GH Hawkins' Fish & Chip Saloon. 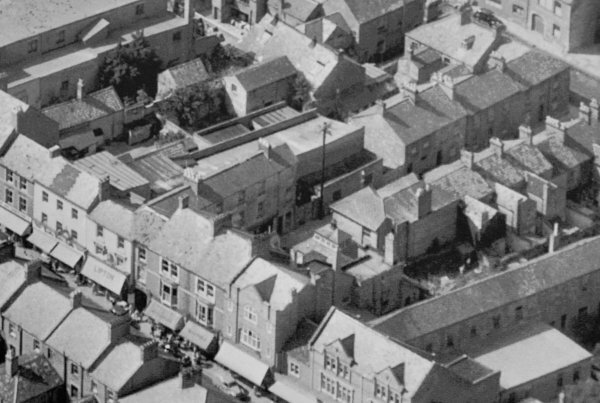 An aerial photograph from the mid-1950s showing Middle Street running diagonally across the lower left corner and Vicarage Street glimpsed at the very top right corner. 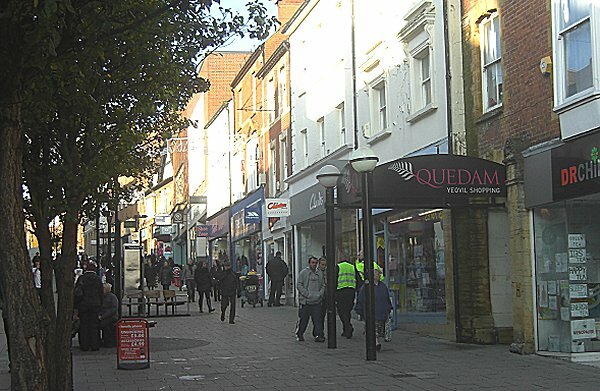 Centrally seen between the awnings in Middle Street is the dark arched entrance to Frederick Place which, itself, is seen to run to the top right corner with terraces of houses on both sides. 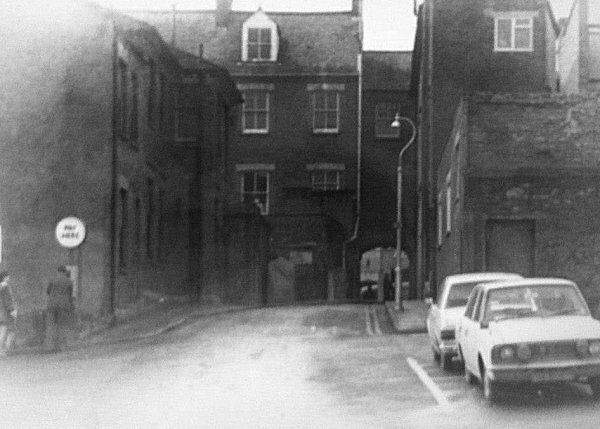 This view of Middle Street dates to the 1960s - the entrance to Frederick Place is immediately behind the van at centre. A photograph of the mid-1960s showing Vicarage Street running across the photograph from bottom left to right centre, with Frederick Place running off to the left. By this time the eastern terrace of houses, seen in the aerial photograph above, had been demolished including John Robin's shop. 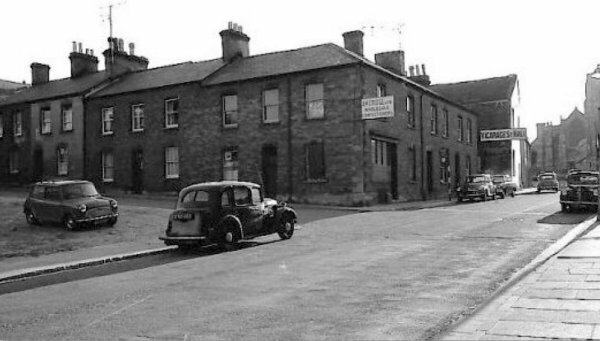 Tony Robins recalled "Our family owned the corner shop and the large plot next door which was the original Cox's Yard. It was compulsorily purchased by the council for just £5,000 and makes you wonder what it would be worth today." 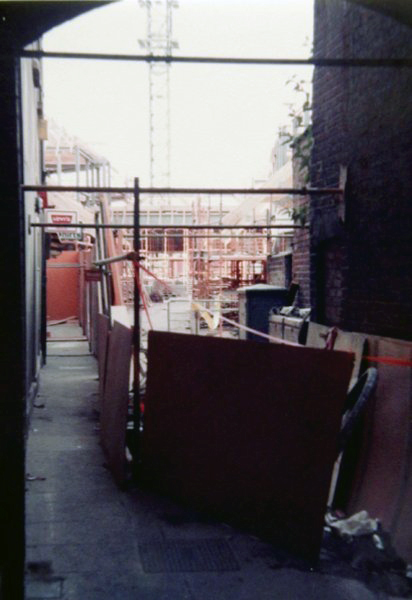 The last remaining buildings of Frederick Place before rebuilding of the area began during the Quedam project. Photographed in the 1960s. 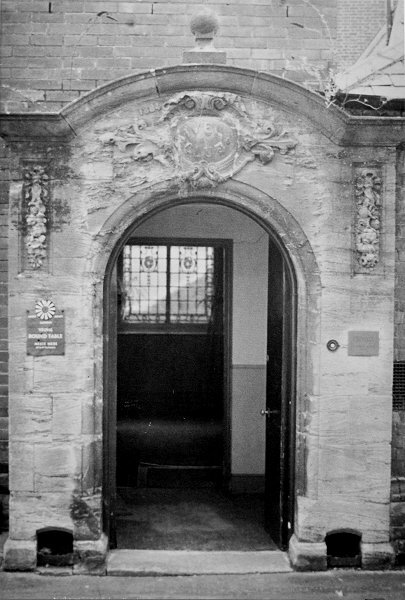 The entrance to the Ivel Club in Frederick Place. Photographed in the 1960s. Courtesy of Chris Rendell - This photograph features in my book 'Yeovil From Old Photographs'. Frederick Place photographed in 1983. 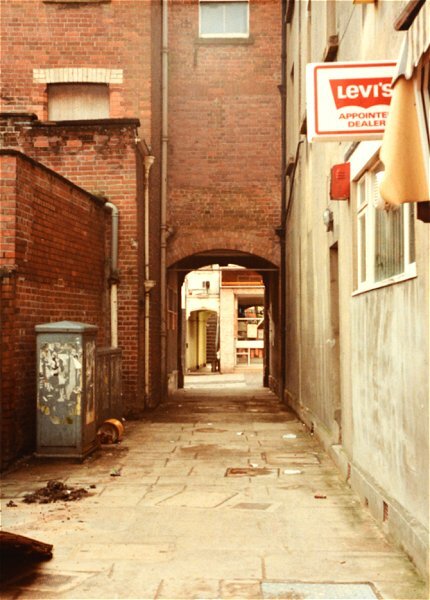 Frederick Place photographed in 1984, also known as Lipton's Arch because Lipton's shop premises were at right. .... and demolition begins in 1983. 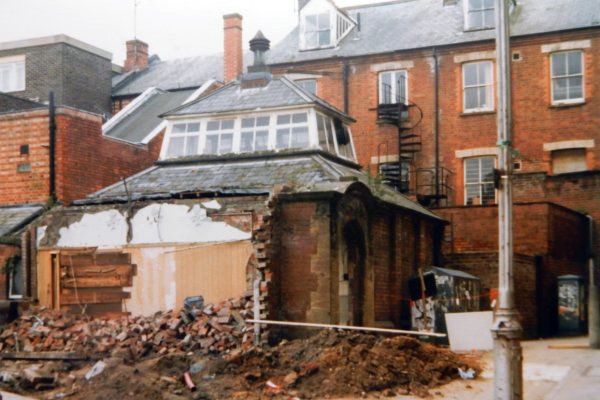 .... and looking the other direction during the demolition of Vicarage Street. At right is the entrance to the Ivel Club. 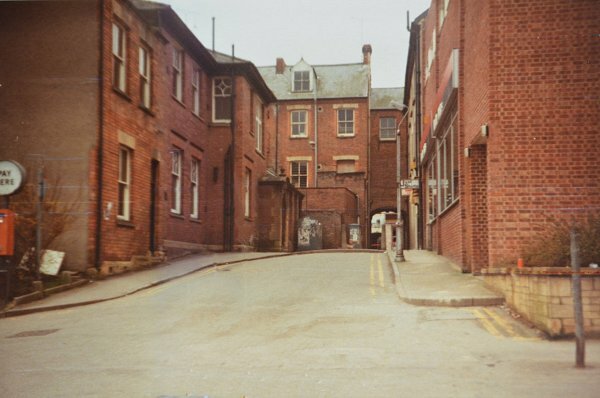 Frederick Place photographed in 1983 from Vincent Place. 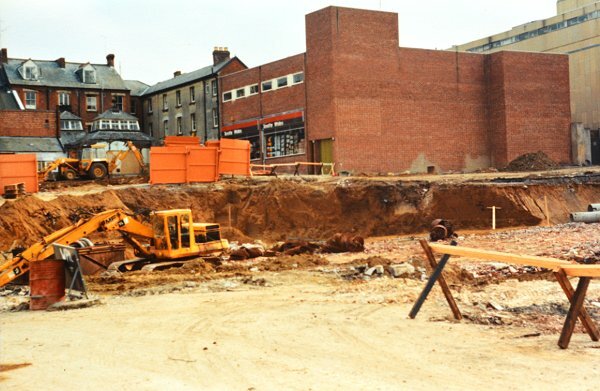 It then got a bit messy in Frederick Place as the Quedam project got into its stride. 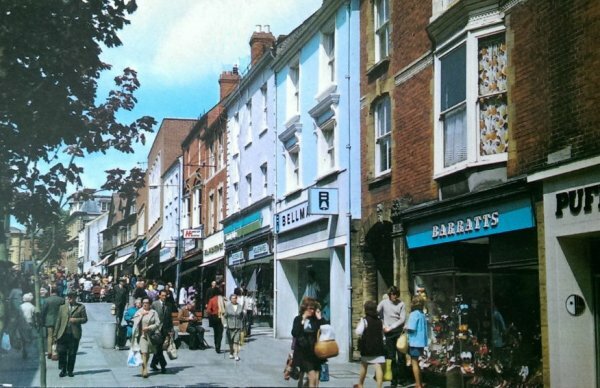 A postcard of Middle Street, dated 1967, showing the entrance to Frederick Place at right. 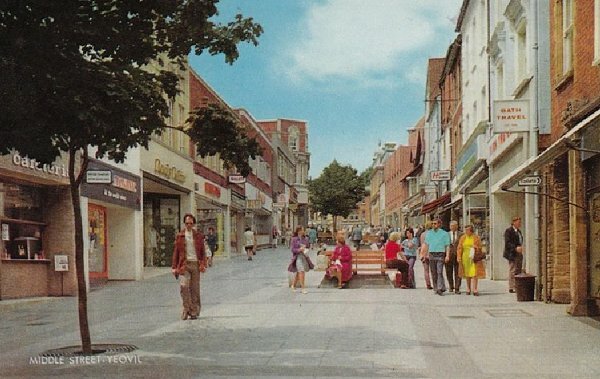 A 1970s postcard of Middle Street, looking towards the Borough, with the entrance to Frederick Place at extreme right. Pretty much the same view, photographed in 2013. The Middle Street entrance to Frederick Place, Photographed in 2016. 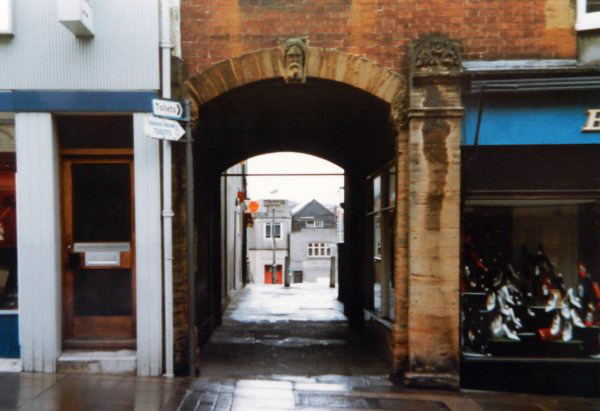 The carved stone head on the arch keystone above the Middle Street entrance to Frederick Place - now somewhat covered over with the canopy projecting into Middle Street seen in the previous photograph. Reputed to be a likeness of Frederick Cox himself, it clearly isn't. Also, it isn't as old as you might think, dating from when the Albany Hotel was rebuilt in 1873.